It's the summer of 1965, and the streets of Queens, New York shimmer in a heatwave. One July morning, Ruth Malone wakes to find a bedroom window wide open and her two young children missing. After a desperate search, the police make a horrifying discovery. Noting Ruth's perfectly made-up face and provocative clothing, the empty liquor bottles and love letters that litter her apartment, the detectives leap to convenient conclusions, fuelled by neighbourhood gossip and speculation. Sent to cover the case on his first major assignment, tabloid reporter Pete Wonicke at first can't help but do the same. But the longer he spends watching Ruth, the more he learns about the darker workings of the police and the press. Soon, Pete begins to doubt everything he thought he knew. Ruth Malone is enthralling, challenging and secretive - is she really capable of murder? 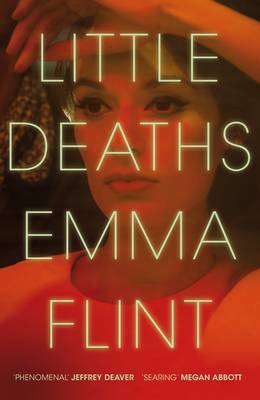 Haunting, intoxicating and heart-poundingly suspenseful, Little Deaths is a gripping novel about love, morality and obsession, exploring the capacity for good and evil within us all. Emma Flint grew up in Newcastle and graduated from the University of St Andrews with an MA in English Language and Literature. She later completed a novel-writing course at the Faber Academy. Since childhood, she has read true-crime stories, developing an encyclopaedic knowledge of real-life murder cases. She lives in London. Loads of suspense in this evocative novel that is wonderful at giving a sense of time and place.